Pineapples are one of the world’s most unique and exotic tropical fruits. 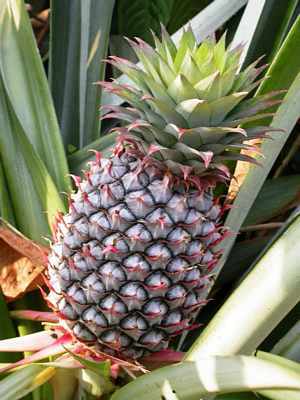 The pineapple (Ananas comosus) is one of the few edible species of the 2,000 that make up the bromeliad family and is the only bromeliad fruit in widespread cultivation. Not only are pineapples delicious, but they are also very easy to grow. Pineapples are native to the southern part of Brazil and Paraguay wherefrom they spread throughout South America and eventually reached the Caribbean. When explorer Christopher Columbus observed them growing in the Caribbean in 1493, they were being grown outside people’s homes as a sign of welcome. Columbus brought the pineapple back with him to Europe and the tradition was picked up by European cultures. In mid 17th century Europe carved stone pineapples were often placed on entrances to houses. This herbaceous perennial plant grows to 1-1.5m tall, and up to the same across, with 30 or more pointed leaves surrounding a thick stem. They are prickly plants so leave space for ease of access. The pineapple is an example of a multiple fruit: Multiple, spirally-arranged flowers along the axis each produce a fleshy fruit that becomes pressed against the fruits of adjacent flowers, forming what appears to be a single fleshy fruit. 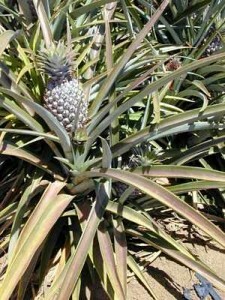 Pineapples are best suited to humid coastal lowlands in tropical and subtropical regions, but in a warm, sunny, sheltered and frost free position, they will tolerate cool nights for short periods. In our warm climate you can plant your pineapple directly into the ground. If your winter weather is any worse than the occasional freeze, plant your pineapple in a pot where you can take it inside. When planting pineapples in the ground, it is important to ensure they have free drainage. Wet roots are the enemy of pineapples. Pineapples can be grown very easily from the top of a pineapple that have been bought and eaten. All varieties can be propagated in the same way. 1. Get your favorite pineapple from the local market or supermarket. Cut off the crown from the top of the fruit and set aside. Eat the rest of the fruit as you normally would. 2. Allow the bottom of the crown to dry out for a day or two. 3. Plant in sandy well-drained soil in a sunny location. 4. Water weekly in the beginning. 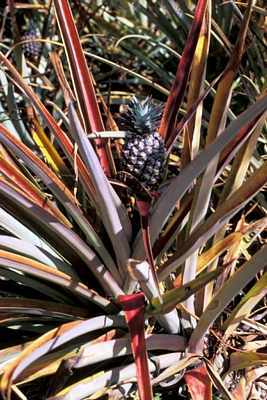 Pineapples, like most bromeliads, prefer water in their vase-like tops, but do not need much water when established. They can get by on very little. Once the young plant is established, pour a cupful of well balanced diluted water soluble liquid fertilizer into the top of the plant monthly. Pineapples take up a lot of their nutrition through their leaves, and the first few months after planting they rely only on their leaves. 5. Avoid getting dirt or sand into the buds at the top of the plant as it may kill it. 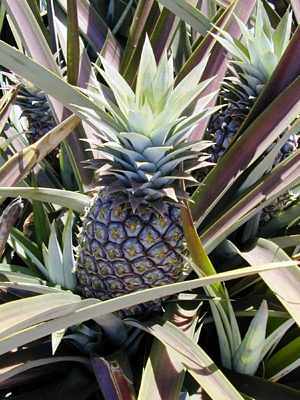 Growing pineapples from crowns can seem to take forever, but typically they produce fruit within eighteen months to two years. A pineapple plant will flower as soon as it is big enough, so the happier it is, and the better you look after, it the sooner it will flower. Once a pineapple flowers you have to wait for another 5 to 7 months for the fruit to mature. The fruit is ready to pick when it starts to turn yellow. Green pineapples are immature and toxic. It is only when they have developed the classic orange colour that they are ready to eat. 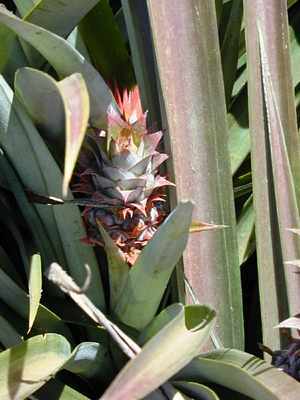 The fruit will start forming in the centre of the pineapple plant. It starts out looking like a large bright red and yellow flower. 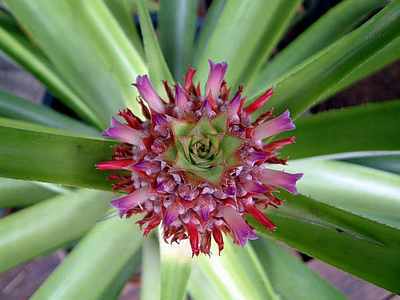 The flower eventually transforms into the normal looking pineapple fruit that everyone is familiar with. Either during or after the fruit on the mother plant has ripened, one or more shoots will grow from the mother-plant stem. If you want your original plant to produce another fruit, leave one or at most two of the shoots on the plant to produce a second fruit. If the plant remains healthy, it may even be possible to produce a third crop. Excess shoots can be cut off and planted. Prepare and grow your shoots in the same manner you did your crown. Because they are larger, shoots will produce a fruit in less time than it takes for a crown. If you have enough space you can theoretically have hundreds of pineapple plants within a few years. Not only is growing pineapples ridiculously easy. If you plant them in the right spot they need virtually no care whatsoever. So go on – give it a try. Want to know how to grow a pineapple; pineapple plants grow inside or outside depending on the weather. All you have to do is tear away some of the leaves to expose the roots a little bit and then place it in good soil. Add plenty of water and watch it start to grow. What we have here is the cut off end – the top of it. What happens after you plant it and what you can expect in the future. So all I’m going to do is I’m going to grab it, and you notice this thing isn’t very pretty looking. It is kind of beat up and old looking. Don’t worry about that. It will grow. So you’re just going to grab this base here and take the top and you’re going to twist it off. Throw your parts in the basket there. Alright, now what you have is all these little leaves right here. So I’m going to start peeling these off. And I can already see there are some roots in here that have started. As you peel back more and more leaves, you’ll see more and more roots. You just kind of have to turn it while you are peeling them off. Ah yeah… now we’re see some nice roots, so we’ll just keep peeling off a few more of these. And you know, really it is up to you have far you want to go. See there’s another couple of nice roots. And I think that’s about good. I’m not seeing too many more roots underneath there. There’s a few. But you know this would be a nice project you could do with say you had kids, family, daughters, sons, whatever. You can show them how to cut open a pineapple, and then you can bring them outside and do a quick little thing and just watch it grow together. So, but anyways, there it is. You got it. See all the roots are exposed. Okay? Follow me over here. Now I’ve got this nice pot of potting soil. I’m going to put it in here and kind of make a soft spot there. Just push it in just like that. Not too far. Then take your water and just water it in. And don’t be afraid to pour it right on top of the pineapple like this. That’s what they are made for. They are made to catch water and send it down to the roots. So you don’t want to put it in too far. But you also need to have it in far enough where it will hold itself up. And there you have it! So now what you will have in a few weeks, you will end up with something like this. And you can see here where the old leaves are. They just need to be trimmed off and this is all brand new growth coming. And this is probably about a month I would guess. So this started from this. And then it takes a while, but in about a year you can force this thing to fruit by putting some sodium carbonate right down in here. Or you can just sit an apple on there, bag it overnight and the methylene gas coming off the apple will force this thing to fruit. 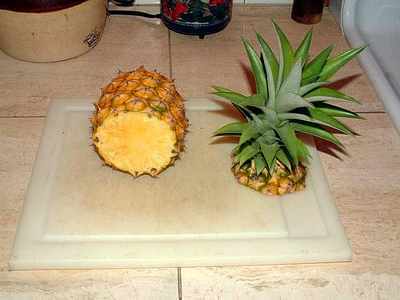 Then you’ll start growing a stock out of the middle with a pineapple on it. And I’ll see you next time! Spain Info Pineapples, San Francisco De Asis, Urb Marina, San Fulgencio, 03177, Alicante, Spain.